Ich habe das total putzige Känguruh mit seinem Baby (Kanga & Joey) von der neuen High Hopes Jungle Kollektion benutzt und mit meinen Supracolor Stiften coloriert. Der Hintergrund ist wieder mit den Stampin' Up pastels gemacht. Der Text ist ebenfalls von High Hopes. I used the absolut adorable Kanga & Joey from High Hopes new Jungle collection and coloured them in with my Supracolor pens. For the background I used Stampin' Up pastels. The senitment is also from High Hopes Rubber Stamps. Paper: Su cardstock "Wild Wasabi, chocolate Chip and Really Rust", design paper "Afternoon tea"
Great Card The kangaroo & baby are perfect. Die Karte ist js süß!! 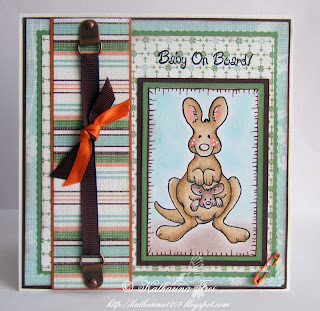 Wauw great card the kangaroo,the colors are perfect. Lovely card!! That Kangaroo is so cute! Oooo so cute!!! Lovely card! What a gorgeous card I'm sure you're friend will love it. The sentiment is perfect with that very cute stamp. deine Karte heute ist mal wieder besonders suess. Mir gefaellt besonders das faux stiching das du um's Hauptmotiv gemacht hast. Love this one! Like that it is another way to do the 'pregnant' card. Oh that is precious !!!! She is going to love it. Fantastic card, love the image and such a sweet sentiment! the brass hardware look fabulous used in that way! This is adorable Katharina! Your work is all so breathtaking. ich verlieb mich immer mehr in die High Hopes. neeee, is das wieder süss, so eine wundervolle Karte, da wird sie sich ganz sicher freuen!!! This is fabulous and I love the sentiment! I think this card is just adorable!!! Love it lots and lots!